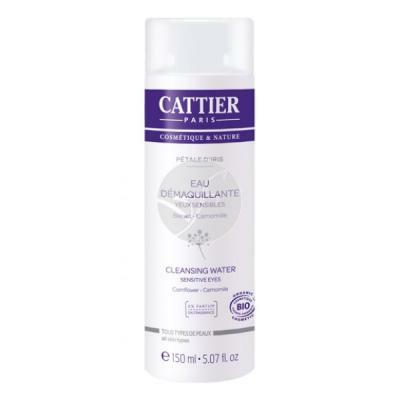 Cattier cleansing water 150 ml. water cleansing __petalos of Iris de Cattier has been specially formulated to clean __this eye makeup without irritating the skin of the eyelids, thinner and more sensitive, like the eye contour __particularmente. Es__ an ideal product for sensitive eyes. Enriched with floral water __de iris, floral water of Chamomile and bio cornflower petals, calms, __suaviza and cleanses the skin. It also has a refreshing effect and __suavizante. Aqua (Water), Centaurea Cyanus Extract *, Anthemis Nobilis *, Glycerin, Sodium Cocopolyglucose Tartrate, Diglycerine, (and) Potassium Sorbate Sodium Benzoate, Benzyl Alcohol, Lactic Acid. * From controlled biological cultivation. Aval Ecocert-Bio. pour a few drops of product on a little cotton and gently remove makeup from the eyelid to the eyelashes.